Due to its location in the Southern Hemisphere, March in Australia means the arrival of the fall season, making it one of the best times to visit this island continent. The extreme temperatures of the summer and winter months give way to pleasant, warm days and nights, and since most kids in Australia are still in school this time of year, you will likely avoid the sky-high prices and clusters of crowds you would normally encounter when traveling during the busier tourist seasons. The exact weather will depend largely on where in Australia you plan on traveling to, though generally, the brutal summer heat slowly comes to an end in the first few weeks of the month as the fall weather takes hold of the countryside. This agreeable weather is common in the states of New South Wales, Victoria, South Australia, Tasmania, and the southern parts of Western Australia, where temperatures typically remain between a low of 53 degrees Fahrenheit in Hobart, Tasmania, and a high of 82 degrees Fahrenheit in Albury, New South Wales. However, in the areas of Australia that are considered to be tropical—like Northern Queensland, which averages highs in the lower 80s and lows in the upper 60s Fahrenheit—the warm weather persists and there is still the possibility of cyclones as the Wet Season continues throughout the month. This is especially true for cities like Cairns, which receive an average of over 14 inches of rain each March over the course of 19 days. Since the weather you'll experience largely depends on where you go in the country this month, you'll need to coordinate your packing with your travel itinerary if you plan on visiting Australia in March. If you're traveling to the northern parts of the country, be sure to pack waterproof shoes, a raincoat, and an umbrella along with warm-weather clothing like shorts, light t-shirts, and even a bathing suit for swimming on dry days. On the other hand, those visiting southern Australia may want to bring a light jacket or sweater since temperatures can drop 10 to 20 degrees overnight. In either case, March is a great time to pack for travel to Australia as you won't need nearly as many articles of clothing as you would if traveling to Europe or other places in the Northern Hemisphere that still require winter gear. In addition to the generally pleasant weather in March, there are lots of things to do in Australia that is specific to this time of year. The general sightseeing activities that most tourists to Australia like to take part in, such as seeing the Sydney Harbour Bridge and the Sydney Opera House, are still available in March, and as mentioned, tend to run a lot more smoothly without the added pressure of huge crowds. However, there are also plenty of annual and seasonal events that happen this month as well. Sydney Gay and Lesbian Mardi Gras: This multi-week event boasts a nighttime parade full of sparkle and glitter that makes headlines around the world and draws in some of the biggest international musical acts and supporters. Though it begins in February, it usually ends in early March. Labour Day: Although this federal holiday is not celebrated on the same date across the whole of Australia, you'll likely come across some version of it during your March trip to the country. In Western Australia, it's held on the first Monday of the month, and in Victoria, it's held on the second Monday. Meanwhile, Eight Hours Day is the Tasmanian equivalent, which is also held on the second Monday of March. 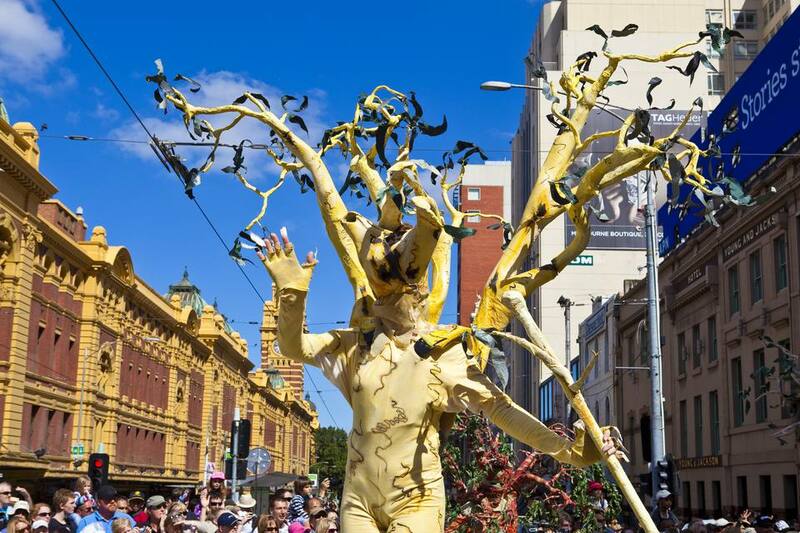 Moomba Festival: Occurs in Melbourne during the Victoria Labour Day weekend and features a colorful street parade with costumed participants and exciting activities taking place up and down the Yarra River. St Patrick's Day: Although not a public holiday, this Catholic celebration is still regularly celebrated in Australia on March 17 or the closest weekend to that date. The strong British and pub culture in the country ensure that this day is remembered all year long. Easter: Although this holiday doesn't always occur in March, many cities across the country celebrate this religious holiday in their own unique ways. The Sydney Royal Easter Show is an event worth attending in March (if Easter falls during the month); families can enjoy carnival rides and indulgent treats if they catch this annual event during their visit. Canberra Day: Another public holiday that is held as a march demonstration in the Australian Capital Territory. Each public holiday is celebrated in different ways specific to the location, so it’s a good idea to check with locals to see what’s on. Although not as cheap as May or November (the off seasons for Australian tourism), traveling in March can reward you with cheaper airfare and prices for accommodations. However, if Easter is observed in March this year, you'll likely find increased prices during the week before and after the holiday. If you plan on visiting more than one location in Australia, you may need to extend your packing list to accommodate for the different weather patterns observed across the country. Visitors to northern Australia should bring attire appropriate for sudden rainstorms while folks visiting the southern reaches of the continent may need to pack a light sweater to stave off the nighttime chills. Cyclone season in Northern Queensland can make travel there challenging in the first half of the month, but storms typically subside by the end of March. Consider booking your northern adventures later in the month, if possible, to avoid inclement weather.